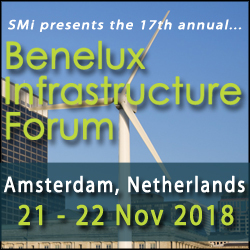 The industry-leading event for the Benelux region; Benelux Infrastructure Forum, is returning to Amsterdam on the 21st and 22nd November 2018 for its 17th consecutive year. This year’s highly-anticipated event will focus on exploring new financing mechanisms and alternative markets for future sustainable investments in the Benelux region. Attendees will have the unparalleled opportunity to meet, network and participate in panel discussions and debates with industry experts and professionals ranging from: banks, infrastructure developers, and institutional investors, to lawyers, government agencies, financiers and regulators. The two-day forum will include an in-depth look at the different project financing models within the Benelux region for infrastructure projects, including: Public-Private Partnerships (PPP), institutional investment schemes, pension funds, debt financing, government funding, project refinancing, and many more. Join us this November to receive insight into the recent trends in project financing for infrastructure in the Benelux area, have a detailed look at international investment into Benelux infrastructure, explore further investment opportunities in renewable energy, and evaluate new mechanisms of investment.